70% of the deterioration in the budget balance comes from the spending side. Steven Kopits: I’m looking at the change in the structural budget balance. Graph in original post was for structural budget balance, too. For me, spending moving up by 1 pp of GDP at the top of cycle qualifies as ‘out of control’ from my perspective. Steven Kopits Look at the OMB historical table 1.2. 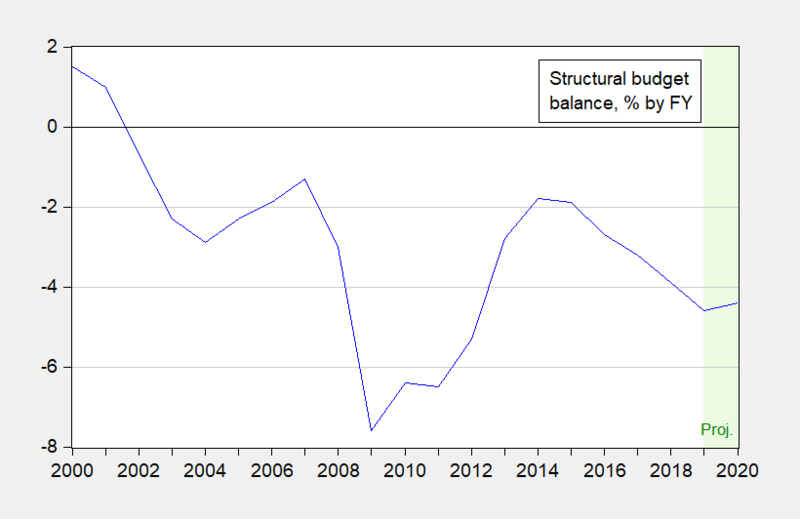 Virtually all of the bump in 2019 spending is a temporary increase on the on-budget side and simply reverses a long run downward trend. It’s still less than anything during the Reagan/Bush41 years. The big problem is the drop in revenue, which is well below where we should be with an economy at full employment. From 1974 to 2007, revenues averaged 17.7% of GDP, and outlays 20.2% of GDP, for an average deficit of 2.5% of GDP. For 2019, the numbers are 16.1% and 21.3%, respectively, light on revenues by 1.6% of GDP and heavy on outlays by 1.1% of GDP. My personal preference would be spending around 18.4% of GDP and revenues at 18.1% of GDP. So by my personal standards, we are 2.3% of GDP light on tax revenues, and 3.1% of GDP heavy on spending. Steven Kopits: And yet private corporations are awash in profits…rather being starved of funds. Makes one kinda wonder about Greenspan’s assessment, especially after his self-regulation of finance experience. So you’re for running up the debt-to-GDP ratio, a la Japan? I’d add, Menzie, that there seems to be a kind of implicit assumption that democracy is only viable as a kind of Ponzi scheme, where we are chronically running up the debt-to-GDP ratio. That’s kind of where Summers and Krugman came out. I’ll confess, I am very uneasy with that approach. Look!!!! Look everyone!!!! ……..We found a Republican who’s happy with a 15% increase in the budget deficit in a single year under a Republican president and a Republican Senate. His name is “Princeton”Kopits. Could there be other Republicans who this doesn’t bother in the least??? “Give us the blood” Republicans!!!!! “Give us the blood” and “let us walk away”……..
Have Republicans abandoned their baby boy “deficit damnation”?? …..with a Republican in the White House?? I’m so confused now. It’s been SO long ago, we forget how the Reaganites pounded big spender Jimmy Carter for his horrendous deficits and the growing national debt. Reagan said (paraphrasing here) that the approaching $1 Trillion national debt was unimaginable, (No word on his comments on the $2.7 Trillion owed at the end of HIS presidency). But by now, we should have grown accustomed to the continued scam that accompanies tax cuts. Reagan, Bush II, Trump. Running for office comes with a promise of balanced budgets, reduced deficits, big reductions in the national debt. Or, as VP Chaney famously scolded Treasury Secretary Paul O’Neil, “Reagan proved deficits don’t matter” Amended, that should read: don’t matter to Republicans if a Republican is President or if Republicans have a congressional majority Any other time, deficits are cause for near biblical wailing and much gnashing of teeth. Especially among Republicans. After all, it was Ron Paul who once asked (paraphrasing again): if Reagan couldn’t balance the budget, which Republican could? Obvious answer: none. Second answer: which one wants to anyway? Certainly not the self-styled “King of Debt” who–along with his family– seems to profit greatly when budgets ARE unbalanced, when deficits accelerate, and when debt seems–as always-out of control and loans are easily obtained. Oh. Forgot. It’s always a “spending problem”, right? Carter was fiscally under-rated. Like Obama, though, he had the bad luck of being in office during an oil shock. Keep repeating this nonsense and we will keep laughing. Not with you. At you. Lord – http://www.bea.gov makes this so easy and you still cannot do it! We tried to get you to check http://www.bea.gov. the 20.3% applies to 2008 alright. It was 17.2% of GDP in 2018. Once again – you refuse to look at the actual data and hence make a fool out of yourself. Stephen Moore was be a liar and quite stupid but you take the cake! You’re hallucinating. Federal spending is where it has been since 2014, between 20% and 20.6% of GDP. Latest=20.04%. The graph goes through 2018. I am assuming it is fiscal year, but it could be calendar year. We are discussing FY 2019, the year after the end of the graph you link. Menzie, I dunno, when I look at the actual receipts and out lays data for FYs 2018 and 2019 I see a different story, than your conclusion: “This picture suggests to me that so far, it’s been primarily a revenue side problem, with spending side issues appearing in FY2019. Since I am looking at actual and not budgeted data, and also going to the data source, US Dept of Treasury, you can point out this is not comparing the structural budget and definitely not to FY 2017. But, I personally prefer to go to the actual data as reported, when doing these deficit comparisons, as opposed to getting into silly arguments about on/off budget, or other authorized versus …. budgeting issues. The deficit is shown in these monthly reports and is actually the simple difference between receipts versus outlays. I prefer this definition to almost any other, as it reduces confusion over Federal Debt/Federal Public Debt, different subjects. CoRev One reason you should look at budget data rather than Treasury receipts & disbursements is that disbursements reflect budget decisions from previous years (up to ten prior fiscal years), whereas receipts only reflect current year budget and policy decisions. So over the short run you’re comparing very different things over very different timeframes. Disbursements lag budget execution. In fact, that’s what is allowing Trump to use prior year MC&H authorizations to fund his wall, with disbursements showing up in FY2019. A second problem with the 2018 and 2019 data is that the 2018 tax withholding was seriously out of whack, as the IRS now admits. In fact, that’s why the IRS is in the process of radically revamping employer W-4s such that (effectively) the IRS will determine your withholding and will do away with the box on the current W-4 that shows the number of exemptions. 2sslugs, use the Treasury terms. Deficit was the term used by Menzie, and that;s what I referenced from the Treasury Reports. Over the short run I’m comparing what the Official Govt Department calculates. Anything else is obfuscation. I think you missed the issue: “…is that the 2018 tax withholding was seriously out of whack.” Low or high, by the end of March, many if not most LARGE refunds have been paid. April is the month most who owe taxes pay. That’s also why many Aprils show a surplus. Will April show a higher surplus due to withdrawal errors or more income? You already know my guess. Ahhhhh – let CoRev cherry pick and misrepresent. If he doesn’t do so daily – Team Trump will fire him and he will be homeless. CoRev This isn’t a big deal, but another caution you need to be aware of is that the Treasury statements include all receipts and all disbursements; however, not all receipts and disbursements originate from Congressionally appropriated dollars. Examples include funding streams for many Dept of Ag inspectors, mine inspectors, and many govt workers at military bases (e.g., MWR workers, daycare, etc.). They are govt workers (not contractors) but they are funded by the people who use their services. Another major example would be all monies associated with foreign military sales, including salaries for govt lawyers, govt procurement and contracting specialists, case managers, FMS logisticians, etc.). Government budget execution and disbursements is byzantine stuff. 2slugs, on this we agree: “Government budget execution and disbursements is byzantine stuff.” and we probably agree that how the Dept of Treasury calculates what and how to borrow lives in that same category, with few outside the government inside decision making circle fully understanding how its done. 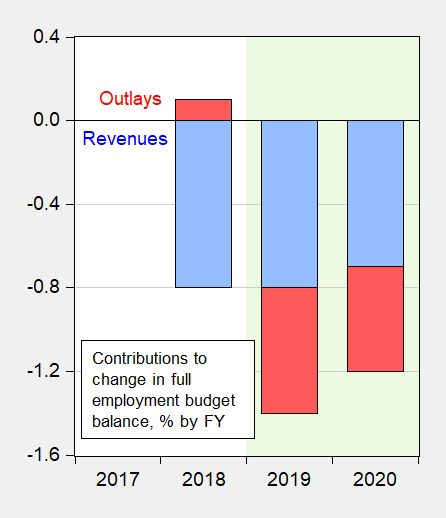 However, none of that obfuscation matters when using the simple math that calculates the DEFICIT as shown in the Dept. of Treasury chart I provided. Comparing nominal changes? You do know how to calculate real spending/taxes – don’t you? Never mind that as we clearly know you do not. Pgl, why do continuously embarrass your self? 1st you claim cherry picking when I covered the mid years of Menzie’s time period? Also as I stated, I prefer going to the data source, Dept of Treasury. That’s not OMB nor BEA. Secondly, why did you alone bring up real versus nominal? Are you daft? We are talking about the deficit, which is clearly defined and calculated in the Treasury charts? We have a new winner for dumbest comment ever. Go back to those Reagan days. Stephen Moore and other right wing idiots like you claimed that tax revenues doubled from 1980 to 1990. Well in nominal terms but not in real terms. This fraud has been put forth many times by people like you and has been the most shot down piece of stupidity of all times. If you do not get that real spending might fall even as nominal spending seems to go up – you are indeed the dumbest troll that ever existed. Then again – we knew that already so HEY! Then again – Stephen Moore would measure nominal government spending relative to commodity prices being the gold bug doof he is. Of course commodity prices always fall. Oh wait – oil prices soared so we have hyperinflation in Moore’s world. And Trump has brought down nominal government relative to oil prices!!! It must be a wonderful world that CoRev and his ilk live in because they can just make up BS numbers to figure whatever intellectual garbage suits them! The structural budget out of control and the economy at best to slow down by 2020 then more deterioration can be expected. More so with an election in the wind. I hope you’re not dancing on America’s grave again. If so, I’m sending Crocodile Dundee to your Aussie home with a large elephant gun and the other half of his bounty to be paid when the job is complete. I’m still p*ssed-off you wouldn’t take my Scott Morrison for donald trump trade. Listen, it still holds, the trade offer is still open. No human has to get hurt, we’re sending it (code name “VSG creature”) inside a small wood container labeled “foodstuffs” by ocean freight, with a jar of mayonnaise and a small plastic spoon taped to the side of the jar. I’m not certain what time that box will have an air-hole drilled into the side before shipment (wink wink). This is a hell of a good deal. Are you Aussies our friends or not?? We’ll even pay all the travel costs and send Scott Morrison back to Australia on a private plane with a pilot of your choosing, if…… the “VSG creature” uuuuhh, “doesn’t arrive to its destination”. Don’t be greedy. It’s been SO long ago, we forget how the Reaganites pounded big spender Jimmy Carter for his horrendous deficits and the growing national debt. Good point. Remember when Reagan talked about tax&tax and spend&spend? He changed all of that to spend&spend and borrow&borrow! I wish someone who was good at PowerPoint or whatever software you would use, would take this graph and after around 1975 circle in fluorescent bright green the parts where a Democrat was President, and then circle the segments in fluorescent hot pink when the Republicans had the White House, and see if you notice anything interesting. In Princeton Steven’s world, Reagan never happened. The peace dividend never happened. The 1993 tax increase never happened. I do declare – we have a new winner for the dumbest comment in the history of time! Steven Kopits Look at the breakdown between on-budget and off-budget deficits. The unified budget numbers for many of those years you mentioned reflect very large FICA surpluses. Everyone knew that those FICA surpluses would eventually go negative as Baby Boomers retired. Today’s problem is that on-budget receipts are too low. On-budget outlays are not particularly out of line. What is out of line today are on-budget tax receipts. Your 18 percent targets are fanciful. Princeton Steven uses the latest rant from Alan Greenspan to suggest that old people getting their Social Security benefits are ruining this country. This is really sad since these old people began paying into the Social Security Trust Fund back in 1983 when the Reagan-Greenspan Social Security reforms substantially increased payroll taxes. That was a good reform but then 18 years later Greenspan was terrified that we were reducing the national debt so we had to give another tax cut for the rich. And since then the same crowd were terrified of the deficits they created so it was time to screw Social Security. Of course this reality is too much for Princeton Steven to grasp as his limited mental abilities are captured by the right wing bubble. SS receipts were spent as incurred. It is entirely fair to include them in general revenues. Had they been used to accumulate assets, I would agree with you. But they weren’t. As for spending as a share of GDP, I think in your scenario Greenspan will be right. In such an event, is democracy viable? Will the system hold together with ever higher tax rates? Look at Europe. They have high tax rates, low economic growth, and plenty of right wing politics. 3. budget deficit as pct of GDP, all the years, rising from 4.2% in FY 19 (already out of date by nearly 1 pp); to 4.5% 2021-2029 (given FY 19, we can probably raise that to 5.0% / year); to 6.0% 2030-2039; and on to 8.2% 2040-2049. Tell me the republic survives, at least in a form that doesn’t look like Argentina. Steven Kopits SS receipts were spent as incurred. You’re misinformed. SS receipts were loaned to the government to offset on-budget deficits. That’s how the SS Trustees accumulated non-marketable bonds. Argentina is what you get when you give tax breaks to the top 1% and tell the rest of the 99% to go to hell. Argentina is what you get when the government decides to default on bonds, which is effectively what cutting SS benefits amounts to. The rich got tax cuts by tapping into FICA surpluses for over 30 years. That’s why on-budget receipts were artificially low. Now that the bill comes due the rich are looking for a way to wiggle out of honoring those Trustee bonds by cutting benefits. The EU countries that are experiencing the most right-wing issues are those same countries that have gone the austerity route. Worry less entitlement programs and worry more about inequality. The gini coefficient for the US is already at Argentine levels. You’re joking, right? You must think I hold your intelligence in low esteem. Doesn’t matter what you call it. You could have called it the ‘Giant Purple Pudding Fund’. If you spent it, it was general revenues. The top 1% pay 38% percent of Federal income taxes. Hardly seems that they’re getting off light. Worrying less about inequality and more about making sure that people’s lives are getting better over time. Steven Kopits Doesn’t matter what you call it. You could have called it the ‘Giant Purple Pudding Fund’. If you spent it, it was general revenues. The government also spent monies from the public auction of government bonds. Does that mean we shouldn’t honor those obligations? The top 1% pay 38% percent of Federal income taxes. They also have the most income, by far. And income taxes are not the only taxes that count. Ever hear of excise taxes? Or gas taxes? Or FICA taxes? Or Medicare taxes? Or state & local taxes that hit lower incomes hard because federal taxes let the top 1% off far too easily? And do you know the difference between the impact of a tax and the incidence of a tax? Are you trying to tell us that high income folks have a less elastic labor supply curve? How about closing loopholes like carried interest? How about taxing unearned income at something that isn’t trivial? How about a meaningful estate tax that only impacts the dead? You should worry about inequality if you’re worried about a stable republic. The IMF points out that there is no case in history of a country holding onto its democratic government once the gini coefficient hits 0.40. We just passed that threshold. And cutting entitlement programs is hardly my idea of making peoples’ lives better, unless by peoples’ you mean the top 1%. A 2.3% increase is revenues is a big number. That more or less rolls back the corporate cuts. Maybe we get a little more out of income taxes. I think we’re already near historical highs. I am skeptical that we can get ‘other tax revenues’ up to 1.7% of GDP, maybe to 1.5%. So, I have not called for reducing taxes. Far from it. But I think there is a limit the upper earners can take. I think the pain will be mostly on the middle class. And does the republic hold together under the circumstances? Note the Stop ‘n Shop strike underway just now. The problem? Increase in health care premiums is eating their pay increases. And that only gets worse. We see similar issues in France and Finland. So, as before, I encourage you to sit down with the CBO numbers and plot your path forward. It’s an eye-opening exercise. So what would Greenspan propose? Pushing grandma over the cliff? warnings about the weight that Social Security, Medicare and other programs are having on what have been otherwise solid gains over the past few years. Funny that he wasn’t concerned about the weight of those FICA taxes running large surpluses for many decades. Who was it that proposed increases in the FICA tax? Wasn’t it some guy named Greenspan? But the reverse is also true. Without those large FICA surpluses the deficits would have been much larger as a result of cuts to corporate taxes and tax breaks for the rich. Greenspan has always had a severe case of amnesia. He frequently forgets that tomorrow’s outlays for Social Security are only possible because Greenspan rejected a “PAYGO” approach and opted for pre-funding. That pre-funding was then pissed away with cuts in on-budget revenue sources. Now that those FICA bonds are coming due Greenspan is wringing his hands over the burden. His hidden agenda has always hinted at a de facto default on Trust Fund bonds, although he would be horrified at the thought of defaulting on marketable Treasury bonds. Funny how that works. Really? Ever hear of something called immigration? I wonder if he knows the difference between GDP and GNP. An aging population means demand will shift away from things that young people want to buy (e.g., large homes, big cars, food, etc.) and towards greater medical care. It does not mean less aggregate demand. The politics are only awful if you insist on a kind of siege mentality and can’t imagine a world that looks different from today’s. A lot of Greenspan’s errors come from his belief that privately funded retirement and health insurance is a kind of free lunch because the costs don’t show up in the OMB budget. But the only reason people save today is so they can dissave tomorrow, and tomorrow’s dissaving would have exactly the same effect on capital investment as government taxing income and transferring it to retirees. Dissaving is dissaving. The elderly will consume the same economic resources for a given standard of living regardless of how it is funded. Economic growth won’t last as the U.S. labors under the burden of growing entitlement programs. Well, what is the point of economic growth? To pile it up in vaults so you can dive into your pile of gold coins like Scrooge McDuck? Or is it to live better lives by spending it? There is no evidence that the economy is burdened by a shortage of investment capital. In fact the opposite is true. Corporations are buried in record profits. They are doing record stock buybacks because they literally have no better ideas to profitably reinvest their profits. There is a glut of uninvested capital such that it is being squandered on IPOs like Lyft and Uber. Part of the reason that corporations see no reason to expand their companies is because of income inequality. There is slack demand because households lack the income to increase the demand. Entitlements actually work to fix that problem by redistributing income and creating demand. So, no, entitlements are not inhibiting economic growth. Income inequality is inhibiting growth.